The winner of the May photo competition is Homesmart who installed a fabulous Mondrian TR17 and sidelight. 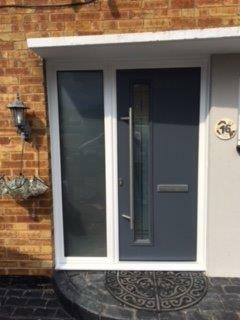 Using white outer frame to complement the slate grey door included a full height side light with sating glass, and a distinctive glazed feature panel using Linear glass. The home-owner chose an off-set pull handle in chrome finish to complete the door.